I’ve been obsessing about vintage linens. Not historic textiles but the sort of linen your Granny had in the kitchen drawer. The sort that might have a few darns but still has plenty of wear and didn’t smear the glasses. Miss Marple for instance might have bought her dusters from the counter in Woolworths but she went up to town, to Derry and Toms for her pre-war quality linen glass cloths. I can’t see myself darning tea-towels but I like the longevity of household linen, the idea that the housewife valued it, and put her mark on it. So I designed the ‘Utility’ top with the good old tea-towel in mind. 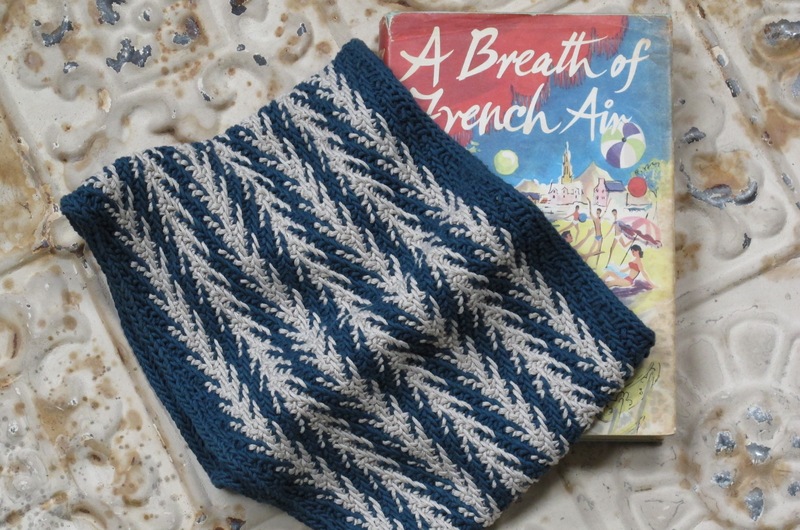 Tension gets to be a little bit critical when you are designing a new pattern and the deep ‘tea-towel’ stripe border of ‘Utility’ was giving me grief. 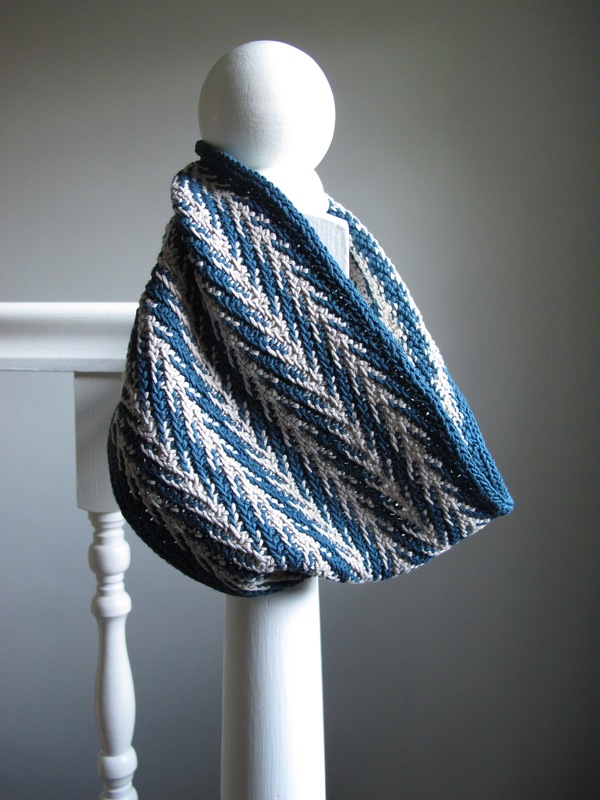 Firstly it is knit in the round and secondly as a slip-stitch pattern it contracts vertically and horizontally. So I decided to take a hint from Elizabeth Zimmermann and make a super-sized tension sample with a purpose. I have to keep well covered when the weather warms up otherwise my frighteningly white skin turns puce in minutes and I thought a summer cowl would be a more stylish solution than a slathering of calamine lotion. Erika Knight’s Studio Linen, cool, smooth and dry to the touch makes perfect summer wear and it softens with washing. It would make an excellent cowl to protect my pearly white skin. The drape is good too so I won’t feel as if my neckwear has me in a stranglehold. 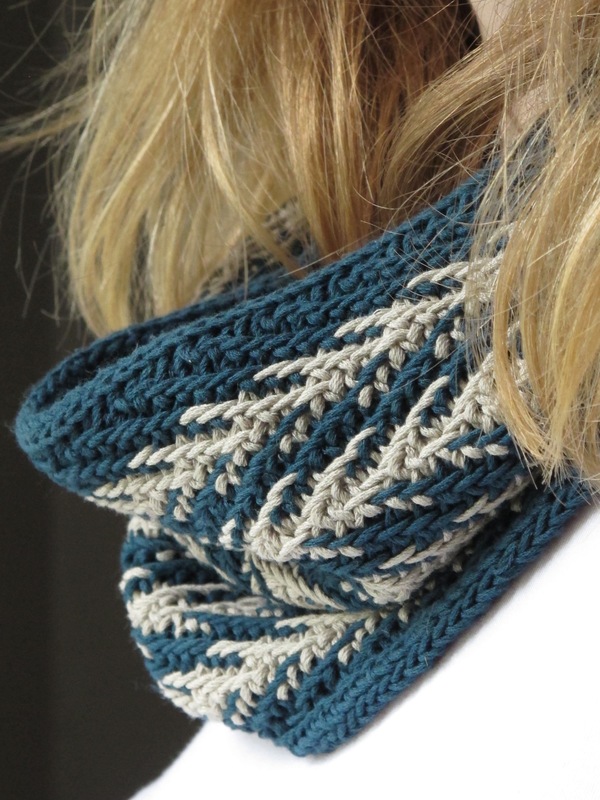 Made with just two skeins the Utility Cowl is a quick project to smarten up your holiday wardrobe. I chose the shades ‘Neo’ and ‘Bone’ which look great with denim or a white shirt. On safari of course ‘Fatigue’ and ‘Milk’ would look the part packed alongside your safari suit and solar topee. Or if lounging on the sundeck of an ocean going liner is more your thing then there are several great nautical shades to choose from. We’re taking our summer holidays in Northumberland so I shall probably wear mine to stop the rain dripping down the inside of my Pac-A-Mac. So stylish! I’d like to thank Grace who stood in as model. She thought she’d come for lunch and a visit to the Henry Moore exhibition at the local gallery. She should have known there is not such thing as a free lunch! Thank you Grace. 53cm/21in in circumference and 18cm/7in deep after blocking. Erika Knight Studio Linen (85% recycled rayon linen fibre and 15% premium linen; 120m/131yds per 50g skein). Contrast colour 1 x 50g skein in Bone (401). 1 x 4mm/US 6 circular needle 40cm/16in long. 1 x 3.75mm/US 5 circular needle 40cm/16in long. Darning needle to sew in ends. Herringbone pattern on 4mm needles: 27 sts x 57 rounds = 10cm, after blocking. kfb: knit into the front and back of the next st.
sl: Slip stitch purlwise without knitting it. ssk: Slip, slip, knit. Slip the next two sts knit-wise, one at a time, return to the LH needle in their new orientation and k together through the back loops. tbl; through the back loops. Using 4mm needles over a multiple of 4 sts. Round 1: [K2, sl2 wyif] to end. Round 2: [Sl1 wyif, k2, sl1 wyif] to end. Round 3: [Sl2 wyif, k2] to end. Round 4: [K1, sl2 wyif, k1] to end. Rounds 5-12: Rep rounds 1-4 twice more. Round 13: [Sl2 wyif, k2] to end. On this round you are reversing the direction of the herringbone pattern. Round 14: [S1 wyif, k2, sl1 wyif] to end. Round 15: [K2, sl2] to end. Round 16: [K1, sl2 wyif, k1] to end. Rounds 17-24: Rep rounds 13-16 twice more. With main colour and 4mm needles cast on 4 sts by the long-tail method. Slip the sts purl-wise back to the left-hand needle so the working yarn is at the far end of the row. *Knit into the front and back (Kfb) of the first st, k3. Slip 4 sts purl-wise to the left-hand needle, rep from *. Each kfb casts on 1 stitch. Cast on a total of 145 sts. Being careful not to twist the sts, join in the round by slipping the last st back to the LH needle, k2tog. Place marker for start of round. (144 sts). Following the chart or written instructions work herringbone pattern starting at Round 1. Work 6 rows main colour followed by 6 rows of contrast colour for a total of 90 rounds finishing with 6 rows of main colour. When changing colour, carry the non-working yarn up the inside of the knitting, trapping it occasionally underneath the working yarn. To prevent it showing this is best done between two knit stitches rather than between a knit and a slipped stitch. Change to 3.75mm/US 5 needles, cast on 3 sts using the cable method. *K2, ssk (the third st of those you just cast on and the first st from the main work). Slip 3 sts purl-wise from right to left needle and rep from *. When you reach the last three sts slip them purl-wise back to the LH needle; k2tog, k1. Transfer the two sts to the LH needle; k2tog tbl. Join the ends of the i-cord cast on and do the same for the i-cord cast off. Weave in all ends. Steam or wet block to measurements. It’s great to find a pattern that you can use your yarn for and make a gift for yourself from your Aunt. What a beautiful pattern … Thank you! Thank you. We hope you enjoy knitting it. So pleased you like it Mary, we had a great time at Wonderwool and the weather was stunning. 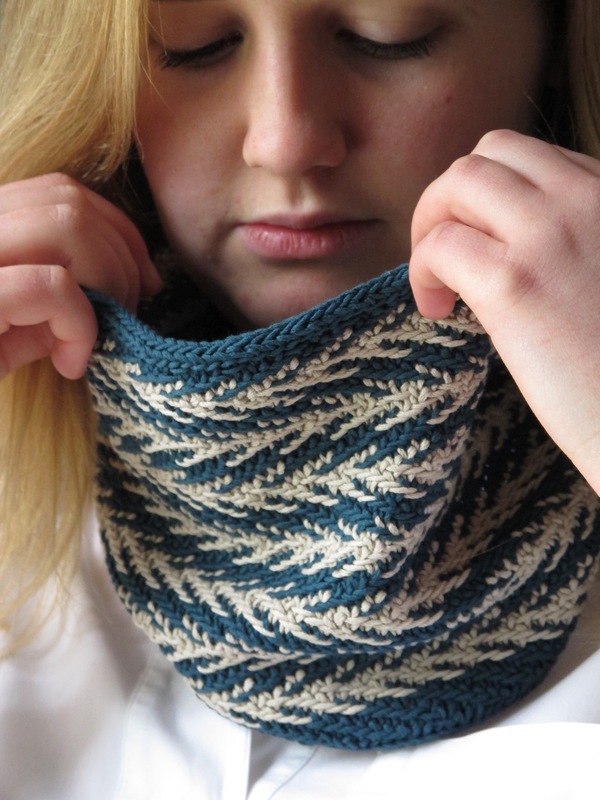 I might have to make a couple more cowls for myself to keep the sun off my neck this summer.